How to use internal linking to build your SEO strategy. Search engine optimization can be a very tedious job at times. With so many different techniques and strategies to implement with SEO, it is easy to forget about one of the simplest ways to see an upswing in organic traffic. What is that simple SEO technique that you are dying to know more about? Internal Link Building my friends, and here are ways to implement this practice into your SEO routine in order to build traffic and convert leads. An internal link is a link on a page to another page on the same domain. Some internal links that you may be familiar with are those in the navigation of a website. Navigation links allow users to steer through the content on the site, as well as show the hierarchyof information pertaining to the website. By contrast, an external link is a link to a website on another domain. Although it can be tough to earn links from other sites to your own site, these do eventually grow referral traffic. For the sake of this article, we’re going to focus on ways internal links can bring more traffic to your website. The purpose of link building is to influence search engine optimization, lead visitors to converting pages, and encourage visitors to click on calls to action. One of the best ways you can use internal linking to build SEO is through content linking with blog posts on your website. This type of link building will help groworganic traffic, lower your bounce rate, and increase the time visitors spend on your website. However, it should be implemented in a strategic way. For example, let’s say you have an orchard and green house business, and you have been blogging about pumpkin patches. You have another blog talking about seasonal hay rides and apple picking. It would be in your benefit to internal link those blogs to each other since they have similar interests. You wouldn’t, however, link a blog post about hummingbird flowers to that pumpkin patch blog page because they don’t have any relation to each other. The important thing to remember when internal linking on your blog pages is user intent. If they came on to your page to learn more about the seasonal hay rides that your orchard/greenhouse offers, it’s unlikely they’ll be interested in a post about what flowers are best for attracting hummingbirds. If a link to that post causes them to navigate away from the content they came to read, they’re likely to feel frustrated. And a frustrated visitor may not come back to your site or to your establishment. Do you know which pages of your site attract the most visitors? For this type of link building, it will be most helpful for you to know which of your web pages are ranking highest on search engines and are receiving the most visits. In order to do this, you can check Google Analytics by going into the account, then select behavior, site content, and all pages. This selection will allow you to see all pages of your site, the pageviews, and the bounce rate. It’s a good idea to select a healthy date range, such as that of at least 90 days, so you can make the best decision moving forward. Now that you know which pages are attracting the most page views, you can decide to use those as internal links in your content pages in order to convert those visitors into customers with the appropriate calls to action! Our mission as digital marketers is to create contagious content that will attract visitors to a specific page on a site and make them a customer. How do we do that? With call’s to action! It is important when designing a landing page for a campaign to focus on where the CTA will lie. Possibilities include bottom of the page, top of the page, or above the fold. When you are completing a landing page, you should ask yourself: does this CTA suggest a visitor takes action, does it offer help, or does it provide a solution? If you can answer those questions, then you are on your way to creating actionable CTAs! As we have learned, link building can strengthen the communication between your website and search engines. This is true for eCommerce sites as well. Implementing links between pages and using precise keywords in your content will help search engines know which keywords you want your website to rank for. By using the phrase “women’s scrubs” as the anchor text for a link to the “women’s scrubs” category on your eCommerce site, you will help Google know that you want to rank for that key phrase. 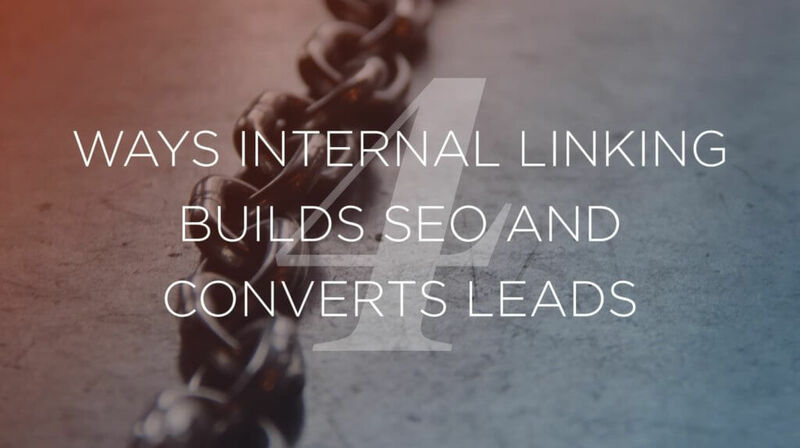 Internal linking is just one way to build your SEO.